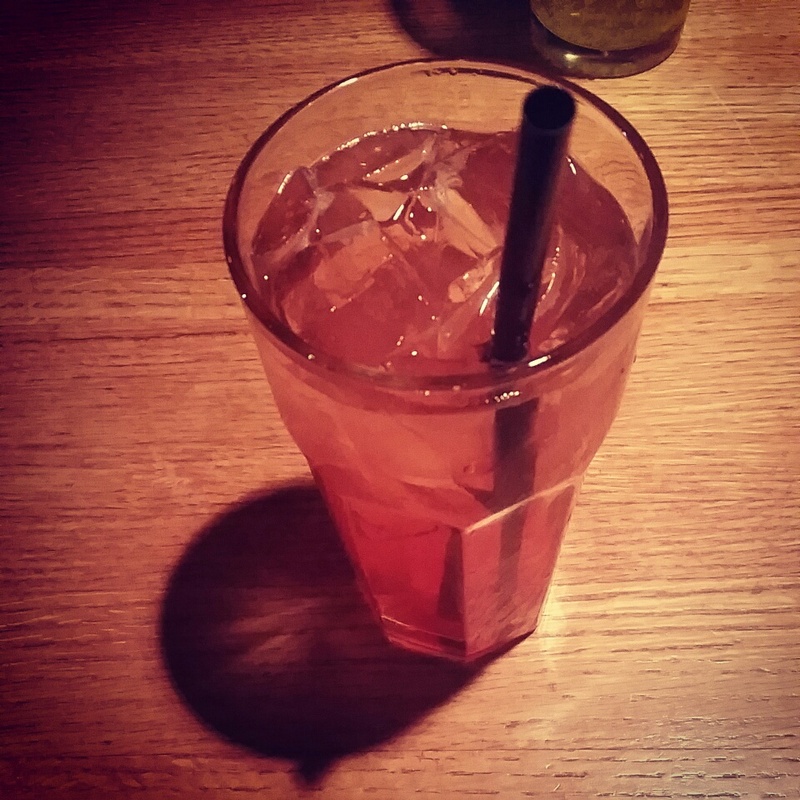 Confessions of a crazed mother: Want to know a secret? My alarm begins and I know a long day awaits ahead of me… Though my alarm is like no other, it is my oldest Isabella “Mommy I sleep on your floor?” then the faint cry of Elleanna from their bedroom begins. Truth is I just got home 2 maybe 3 hours before my wake up call and I am far from ready to begin my day. Before breakfast I need to get myself together… Brushing the teeth and all that lovely bathroom routine though I like to slip into the shower I am never alone. With Elleanna opening every drawer and taking out nail polish, hair bands, makeup and trying to throw them in the shower as I think twice… “Did I wash my hair… Is the soap still in? No no I should condition it.. Wait no darn it I didn’t shampoo!” Isabella crying that she wants to go downstairs with my sisters and her MiMi. By the time I step my foot out of my eight minute shower (yes sometimes a bit more to wake me up) Isabella has already found herself downstairs and MiMi has already gotten the bowl of cereal together. Do you remember after a bad day what you have to be thankful for? And how do you unwind as a parent? In exchange for my time and efforts in reporting within my blog and social media networks Fuego’s Grill has provided my family and I with delectable foods. Even though we have received these benefits my opinion is always 100% mine. As many of my readers know Geraldo and I are not from Maryland, we relocated our children and ourselves from Central Florida where our foods were less burgers and more rice and beans. 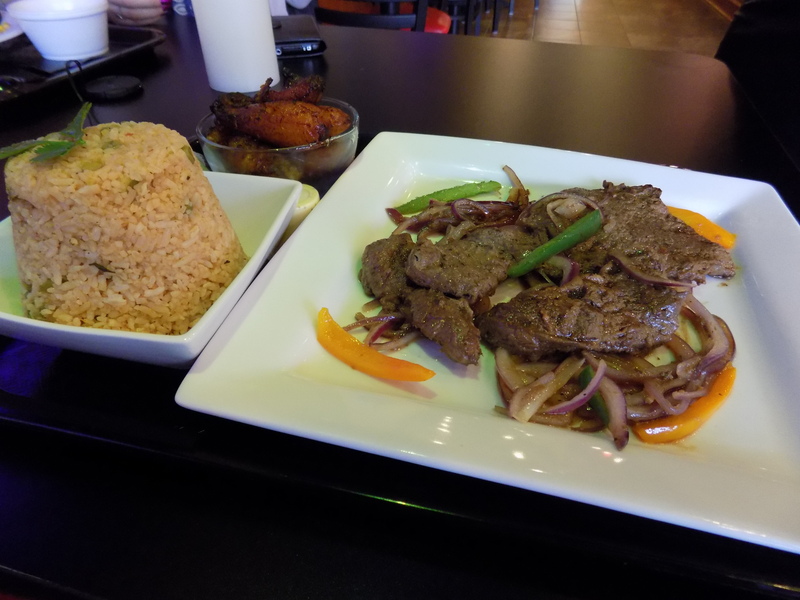 We find ourselves craving so many foods that you can’t find just anywhere here in Maryland and if you do it just isn’t the same… This time we found it; the perfect Latin grill to quench our appetites! A small but charming restaurant perfect for many occasions… Date night, quick lunch or a relaxing dinner Fuego’s Latin Grill has it all; from the family atmosphere to a romantic dinner near their “fire place” you’re stresses will be melted away with friendly staff and the clean surrounding. Not to mention the mouth watering food! 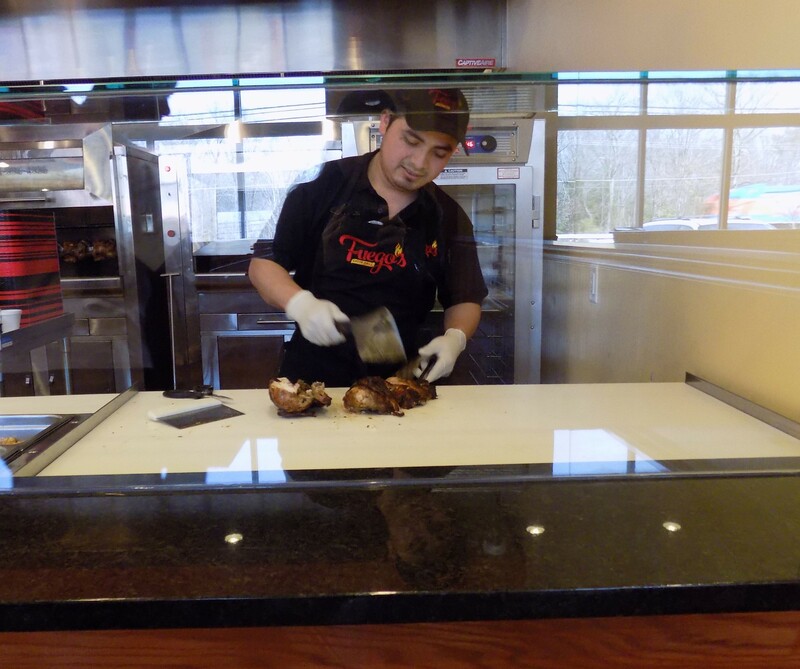 We loved seeing our chicken prepared in-front of us. Recently opened December 27th of 2014 owners Joseph, Grace and Aide have come a long way and still are adding expansions which include delivery. What better way to end your work night with some savory rotisserie chicken. As a waitress I work many odd hours and on occasion I am able to eat dinner with my family of ocho I cannot think of a better way then a Fuego’s special. I had the pleasure of dinning out with my youngest daughter Elleanna and Geraldo to enjoy some of their rotisserie chicken, steak, fried tostones and sweet plantains not to mention their Dominican rice which was one of Elleanna’s favorite sides. 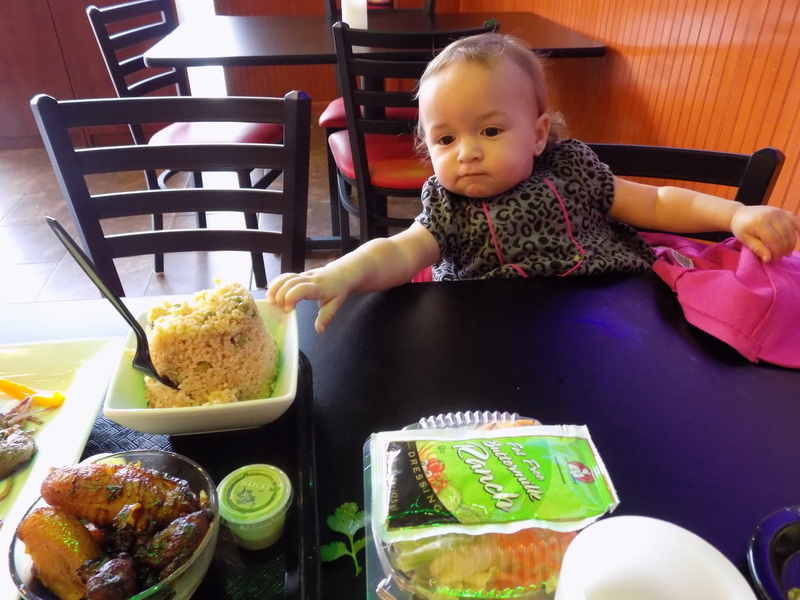 Elleanna couldn’t get enough of the Dominican Rice! Elleanna hasn’t ate this well… We haven’t ate this well in some time now. Their vegetables, mashed potatoes and side salads we’re a perfect touch, adding a healthy mix with their impeccable seasoned meats. No need for any sauces to be mixed with these heavenly meats. I cannot express how happy I was, stress free enjoying the delightful tastes of the tostones that I’ve missed for months since moving north. The staff so friendly and attentive to our needs plus adding extra touches that made our visit so enjoyable. 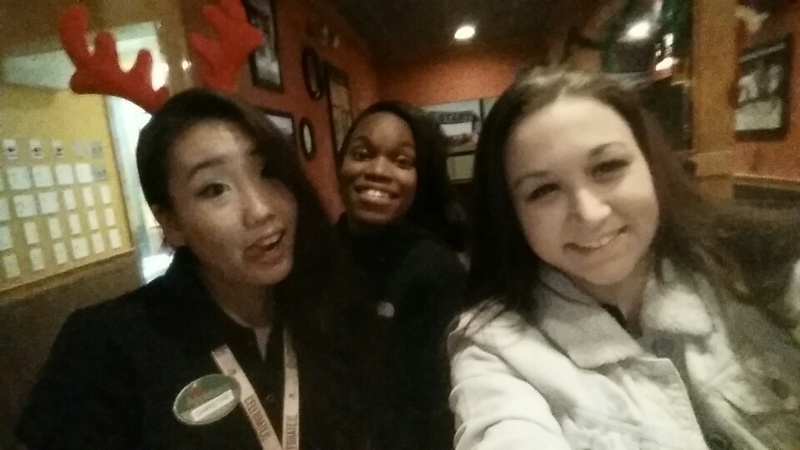 Their pleasant smiles, anxiously waiting to take your order, help bring our food out and converse with us made me feel as if we were not at just any restaurant but as if we were at a family members house. After having a delightful conversation with Aide and Joseph many of my questions were answered. If there would be more dishes added to the menu ( About twenty to come in upcoming posts; with more professional photos and details.) and also the fact they provide catering. I am left in amazement at the atmosphere, mouthwatering foods and now the catering. With upcoming family events, birthdays and everyday celebrations how can we go wrong with these perfect foods? 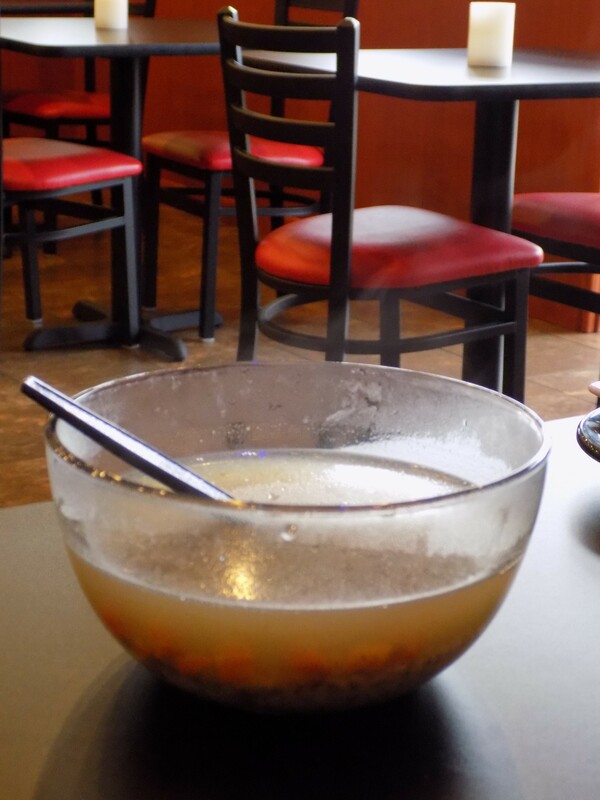 What better way to warm yourself up with some hot chicken soup? 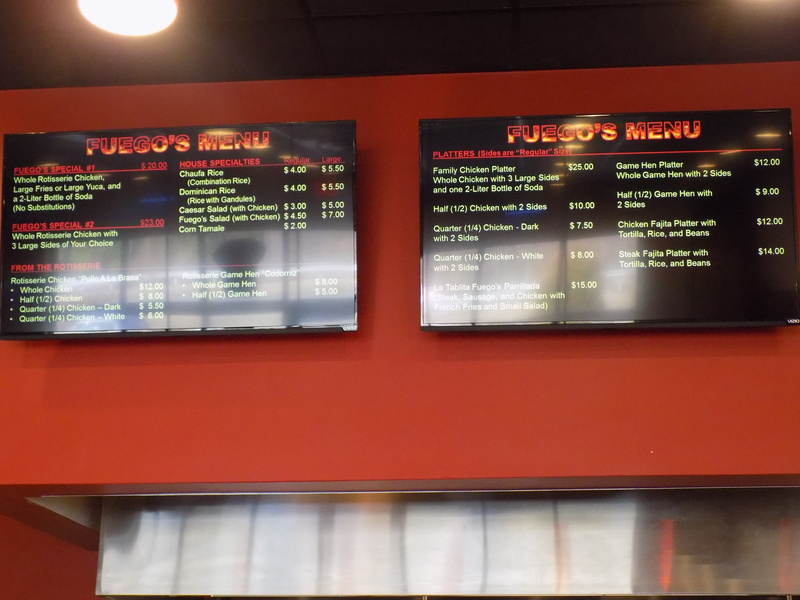 Since being recently opened there are many expansions that are being added to Fuego’s Grill. As a mother of two little girls I wondered what kind of drinks that they offer for children and to my delight they will be adding healthier kid friendly drinks. Though they have a wide range of fountain and bottled soda, water and Gatorade my concern was on juices and milk. Also I was so happy to see the Raspberry Vinaigrette for my side salad, fresh cut vegetables always hit the spot for me and to hear they are looking into adding even more salad dressings to their Ranch and Raspberry Vinaigrette made me smile very hard. The mouthwatering rotisserie chicken that Elleanna and I shared. Look at the amazing amount of food they give you! To tell everyone the truth I not only believe this is a Waldorf hot spot but my families new favorite Latin Grill! Have you ever eaten some fresh tostones or sweet plantains? 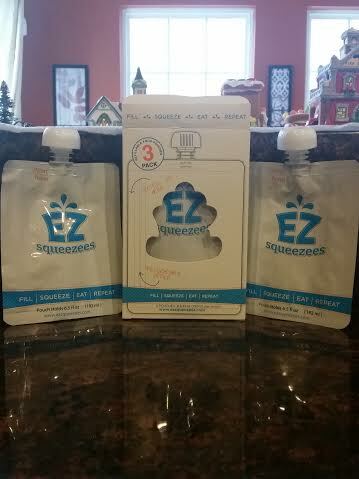 In exchange for my time and efforts in testing and reporting my opinion within this blog, EZsqueezees has provided me with complimentary EZsqueezees. Even though I receive these benefits, I always give an opinion that is 100% mine. I have become so desperate in the last few weeks… Multiple bath times a day because of Miss Independent wanting to feed herself just wasn’t working for this working mother. 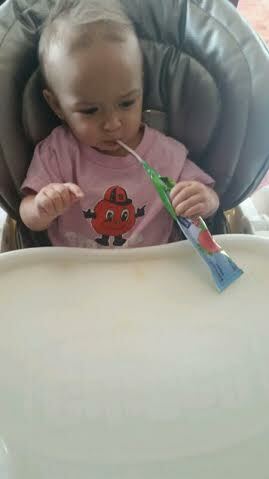 I tried everything as you can see including taking a straw into her yogurt and tapping it. I may be a bit creative, wacky, though it worked for a few minutes or half the yogurt until she began squeezing it with much more pressure. My savior arrived right as Christmas was arriving itself! 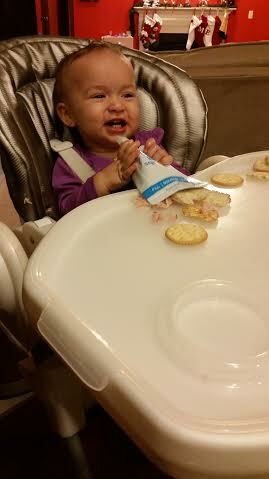 Which meant Christmas dinner was around the corner which would have our favorite side, applesauce. 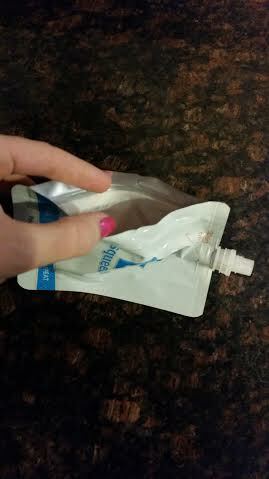 What a perfect time to test these newly found pouches out. 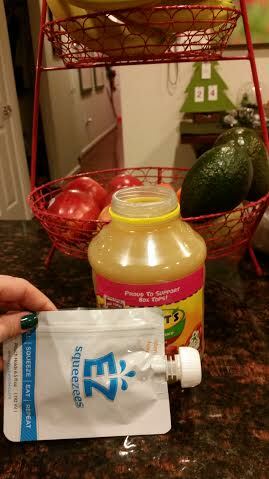 The large openings made pouring in apple sauce and mommy’s yogurt such an easy task without a mess. The tops gave me an opportunity to not think about it spilling while being filled… Thank goodness since my blond side usually forgets about this with other snack time helpers! I have done some testing on them also… Mommy testing, holding them upside down which took a few minutes before spilling without the top of course but if the children are anything like my Elleanna they like to hold it over themselves or the floor. It’s like a challenge for Mommy to get to before the mess arrives. I was worried about the food being stuck in them after washing so I took extra steps. (Hand washing and straight to the dish washer.) I was beyond excited to see they were dishwasher safe! In my own opinion the heat that the dishwasher would put on the product along with the soaps being used maybe in areas I didn’t reach well enough. With my first daughter Isabella I used to steam her bottles, pacifiers and some toys. I was that paranoid mother that would make you wash your hands five times before holding her! Now after being a mother for about two and a half or three years before having Elleanna I thought I was a know it all on mothering by my second. Boy was I wrong! Many changes from formula to breastfeeding and diapers don’t even get me started on what to feed her, nap times and story time routines. I’m getting off topic though so back to my point I learned how important snack time helpers were with Elleanna and also snacks on the go at all times for all ages. 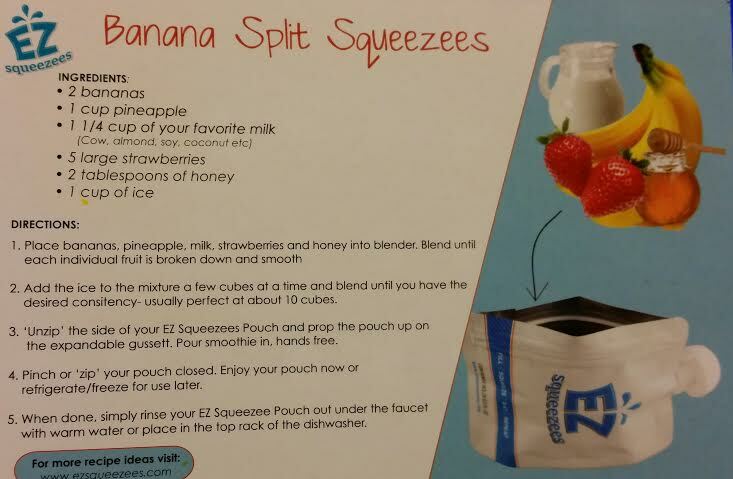 We finally found a snack time helper with EZsqueezees that will be useful not only to Elleanna but also Isabella; from the kitchen to the car we’re set to eat our yogurts, applesauce and smoothies. 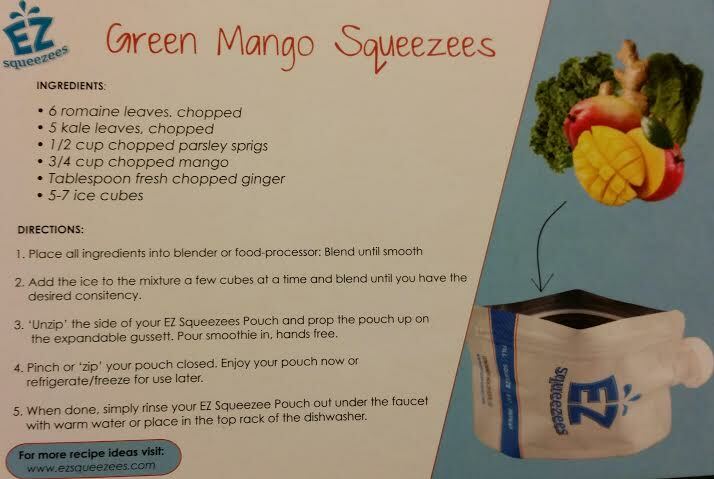 Take a look at the wonderful recipes that EZsqueezees recommended us. 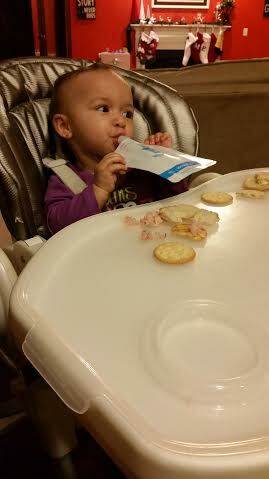 How do you keep your children’s snacks off the floor and in their tummies?